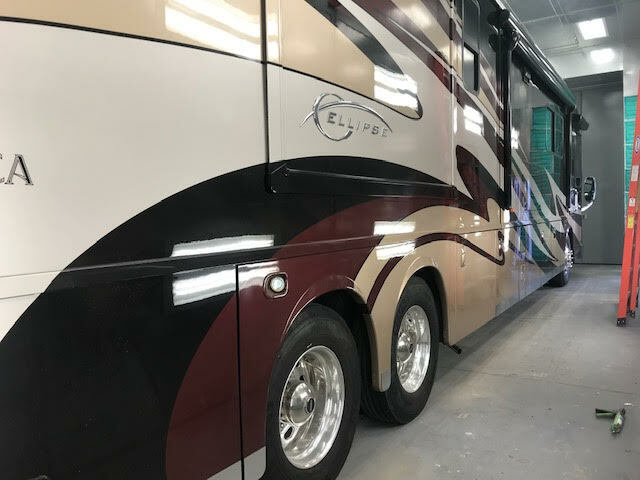 You want your RV to look good, so Cousins RVs’ paint specialists only use the latest advanced painting systems and techniques that are out there. We specialize in multi-color, custom paint matching via computer and custom paint schemes. Our specialists can recreate high luster finishes that have become a trademark of custom coaches. Our expert service technicians are so talented that we provide a limited lifetime warranty on our RV’s and small trailer repairs. Our gigantic state of the art paint booth (one of the largest in the state) 55' long and 16' X 16' downdraft spray cabin that his heated and able to bake-cure a new paint finish. This gives us a distinct advantage over other RV Paint and RV Body Shops. Our refinish specialists use Axalta Coating Systems. 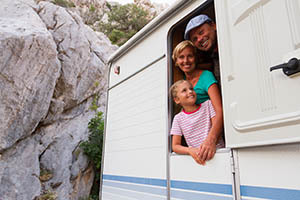 We know that your RV or small trailer is like a member of your family and you don’t like just anyone working on it. We understand completely. We make sure that out RV body repair shop specialists are trained in the latest techniques and have years of experience working with RVs . You can breathe a sigh of relief secure in the thought that your “baby” is in the best possible hands and getting the best service possible. In the more than 50 years Cousins RV has been around, we have taken care of thousands of RVs and motorhomes. We are experts in fiberglass reconstruction and metal fabrication, using only the most state-of-the-art techniques and machinery. 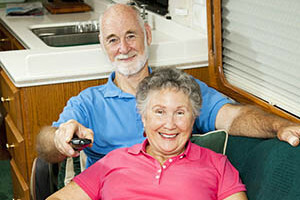 We can work with insurance companies to make sure your RV is repaired with as little out of pocket money as possible. Cousins RV’ body shop is the best in the industry and you’ll know it the second you walk in. Don’t let your cracked or broken RV windshield be replaced by standard car windshield specialists. An RV windshield is a completely different animal and needs to be installed by a professional. Cousins RV are experts in windshield replacement and repair making us your windshield specialists. We are fully backed by manufacturers and insurance agencies to provide top notch window service. 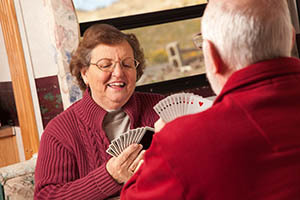 We specialize only in RV windows and understand the importance of the windshield for structural integrity. Our expert windshield technicians can complete any needs or requirements you may have. They will use only the best glass and proper materials to make sure your windshield meets or exceeds your vehicle’s factory specifications. Is your RV looking a little shabby? Maybe you need a custom paint job that can the pizzazz and attractiveness back to your vehicle. We’ve been providing service to the Loveland area for more than 10 years, a Premier Coach Works custom RV paint shop can make your motorhome or toy hauler look better than when it came out of the showroom thanks to their years of experience and professional ability. If a complete makeover isn’t needed, then maybe you should think about getting some touch-ups to those problem areas. We can do that too. Cousins RV is a cut above the rest with a modern service center and professional, educated personnel ready and able to get your repairs done quickly and affordably. We take care of every aspect of the repair from start to finish. 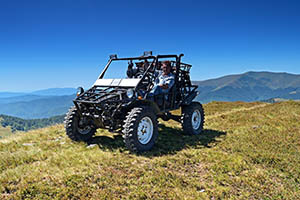 We are, by far, head and shoulders above the rest and repair all types of RVs from motorhomes to toy hauler trailers. There’s never been a better time to visit our expert paint shop professionals. They can make sure your beloved motorhome gets the respect and treatment that it deserves. There’s no need to spend your hard earned money on a brand new RV when you can get that new look with your existing ride. A new paint job can breathe new life into your RV. Call Cousins RV today for a free estimate on a professional paint job. Couldn’t believe how great of a job you guys did. Couldn’t even tell that our toy hauler trailer had even been hit. Thanks so much! I couldn’t be happier. We were on our way back from Wyoming when we went off the road and almost destroyed our small RV on a large boulder. The guys at Cousins RV had our RV brought in and repaired in time for me to get back to work Monday morning. The staff is awesome and the guys in the body shop did an amazing job on painting our used Heartland RV. I don’t think I’d use another RV dealer if someone paid me. I want to thank you all so much. After I convinced my wife to buy RV campers for our family reunion, I thought I’d never live it down when I damaged the rear end on one trying to back out of our driveway. 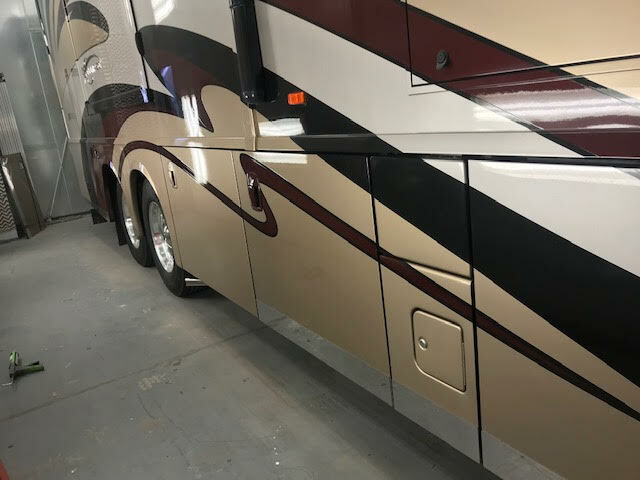 Luckily, the insurance we took out through Cousins RV covered the damages and the fellas in the service bays were able to make it look brand new. Does Cousins RV do Body Work and Collision Repairs for RV Motorhomes and other Models? Of course we do. Our brand new paint booth dwarfs most others in the state at 55' long and 16' x 16'. We can paint anything from an RV motorhome to busses, travel trailers, toy haulers, fifth wheels, horse trailers, and cargo trailers. We have more than 25 years of experience in body work and painting RVs and trailers. We can provide aluminum trailer hail repair after those troublesome thunder storms, fiberglass repair on trailers and motorhomes, as well as collision repair. We provide quality work with a quick turnaround and service almost all makes a models. We even have the ability to color match with DuPont Acquire Digital Paint Color Matching (excludes all Airstream models). What should I do if someone hits my RV with their vehicle and causes damage? First, check to be sure everyone is okay! Next, notify the authorities so they can come out and get all the necessary information for your insurance claim. Be sure to get the officer’s name and the incident number for your insurance adjustor. Then call your insurance adjustor. It’s crucial to document all the damage to your RV. It’s very important to take photos of the scene before anything gets moved. Take several photos from different angles and distances. This will greatly help your insurance adjuster in processing your claim. Sometimes stories change after the fact, and detailed photos can help prove who caused the accident. After that you will need to deal with getting your coach to a licensed and insured collision repair facility to determine the extent of the damage. Hopefully it is driveable, but if not, you will be glad you thought ahead and have an emergency roadside assistance policy. What can I do to extend the life of my awnings? Clean and inspect your awnings regularly. When it’s raining, get in the habit of periodically lowering one end a bit to allow water to run off. Water is heavy and the additional weight can damage your awnings. Always close your awnings in winds over 20 mph. Never leave your awning out unattended. Close it up every night. Use the tie-downs to prevent any sudden gusts from damaging your awning or RV. Always remember it is easier to prevent damage than it is to repair it. As a side note, some people are surprised to learn that their policy does not cover awnings, so check with your insurance provider to be sure your policy covers yours. If not, purchase the rider for it. The outer shell of my RV seems to be developing bubbles or waves. What is that and how can I fix it? That sounds like delamination. The skin of your RV is a smooth fiberglass exterior wall with a styrofoam or fiberglass center, and more fiberglass to seal the center. There is adhesive between the layers, which is supposed to make them one bonded unit. This new method, developed in the early 1990s, greatly lowered the cost of building RVs and improved gas mileage with better aerodynamics. Everyone was happy until the drawbacks of the method became apparent later in the decade. Over time, moisture invades the walls and the layers begin to separate causing this wave/bubbling look. Often the first sign you will see is small blisters or bubbles forming on the sides of your coach. This should be repaired by a professional before the problem becomes much worse. The usual repair in the early stages is to remove the damaged section and replace it. If you bought the RV used and you wait till the entire side of the RV needs to be replaced, it will likely cost more to replace it than you paid for the RV, so it’s best to fix this problem early. Should I paint my RV myself? While you certainly can paint your RV yourself, it may not be the best idea. 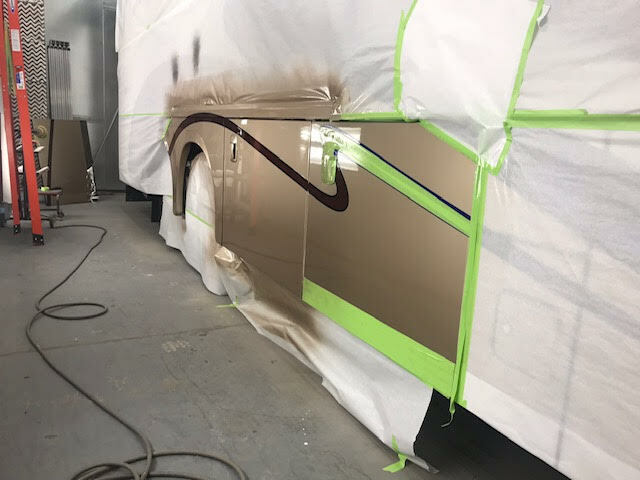 Painting an RV can be a long and difficult process. The RV not only has to be cleaned and checked for paint bubbling and other damage, but also at least one coat of primer needs to be applied before you begin the actual painting. The experts at Cousins RV have years of experience behind them as well as all the latest certifications. They guarantee your RV will come out looking amazing. 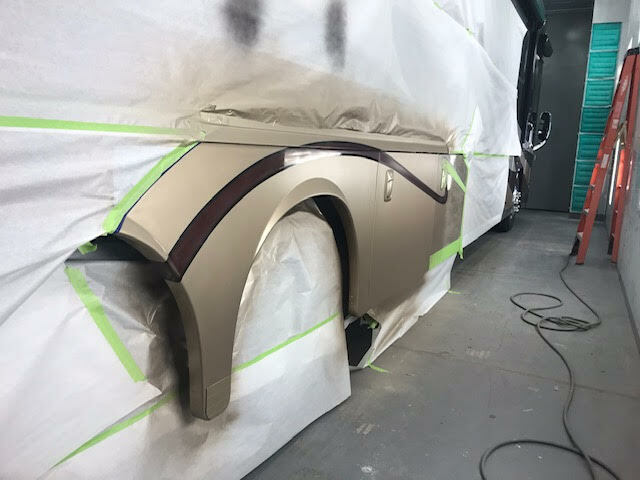 There are many issues that a confident do-it-yourselfer can fix on an RV, but when it comes to the delicate job of painting, it’s best to leave it to the experts. What about the body of my RV? What should I look for? Look for cracks in the silicone. Look for wind damage. Check the roof especially. Check the windows for cracks and rock dings. All of these are issues that should be fixed soon-before they get any worse. What about the paint? What do I look for? Check the paint for oxidation and weather damage. Is it dull looking? Keep it washed and waxed to avoid these issues. How do I keep my RV roof in top shape? There’s no doubt that your RV roof takes the brunt of the damage from bad weather and the baking rays of the sun. Roofs are designed to take a beating, but it’s always a good idea to keep it in the best shape possible. Your roof is likely made of rubber and should be cleaned 3-4 times a year. If you can’t see the surface of the roof because of dirt, etc., then it’s time to clean. Regular soap won’t be effective and you should only use commercial grade rubber roof soap. Once the roof is cleaned, cover it with a tarp or other covering until you are ready to use it again. You should also check the rubber roof tiles to see if the sealant is degrading. This can cause water to get into your RV. If you have sealant degradation, use a self-leveling sealer to keep it down. You can also use the sealer to fill in any cracks you may find as well. Is your windshield broken, cracked, or spider webbed? These types of windshield damage can become an issue when you want to get away in your motorhome. You don’t have to let a damaged windshield keep you away from the open road and the RV lifestyle. Cousins RV has a wide variety of high quality windshield replacement services in Loveland, Colorado and the surrounding areas. We don’t rush the job and make sure your windshield is installed properly â€” and you don’t even have to deal with any insurance companies. We will handle all the paperwork and other issues related to the claim, so you can focus on getting back on the road. Normal wear and tear can sometimes cause damage to your side windows, including broken and peeling seals. You can tell if you have side window problems if they begin to fog up on the inside. We can repair and replace all kinds of side windows and glass. We can get them sealed or replaced as necessary. Once again, we’ll manage all the contact with the insurance company so you don’t have to.